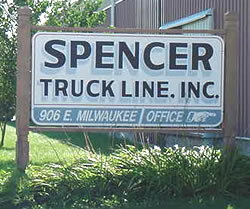 Welcome To Spencer Truck Line, Inc.
Having trouble moving your load?? Let us handle your freight needs. We offer brokerage services through our wholly owned subsidiary, STL Truck Brokerage. As a freight broker and trucking company, we can help you get your freight moved to its destination. We understand the demands of the transportation world. As a carrier using brokerage service daily, we understand the importance of time frames and prompt payment. All text and original graphics copyright © 2005 Spencer Truck Line, Inc.